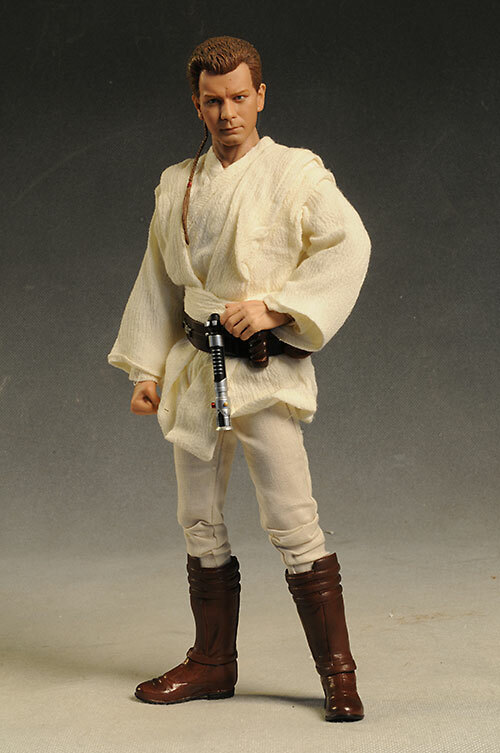 When Sideshow first started their sixth scale Star Wars line, they focused on various human characters. Next, they moved to armored characters like Vader and the Troopers. Occasionaly, they mixed an alien in, and in the last year have given us quite a few more aliens than before. I don't know about you, but I've been most happy with the creatures, followed by the armored characters...with the poor humans pulling up the rear. 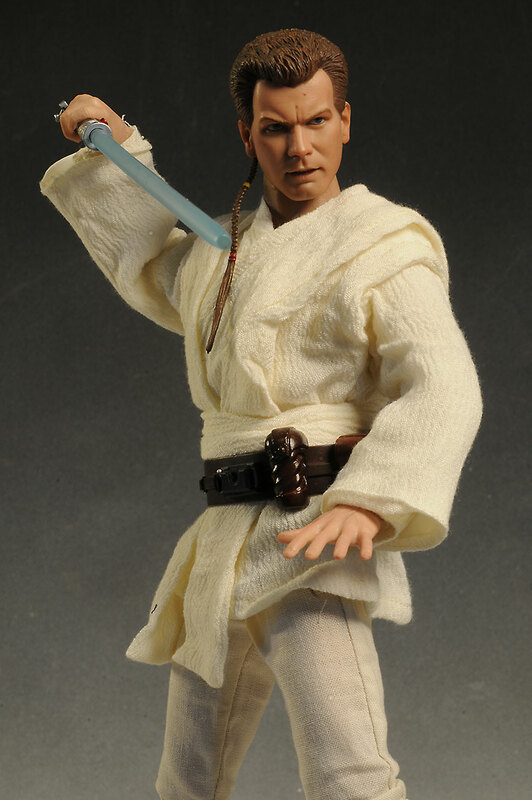 The latest release is a step back to the human side, with the padawan version of Obi-Wan. 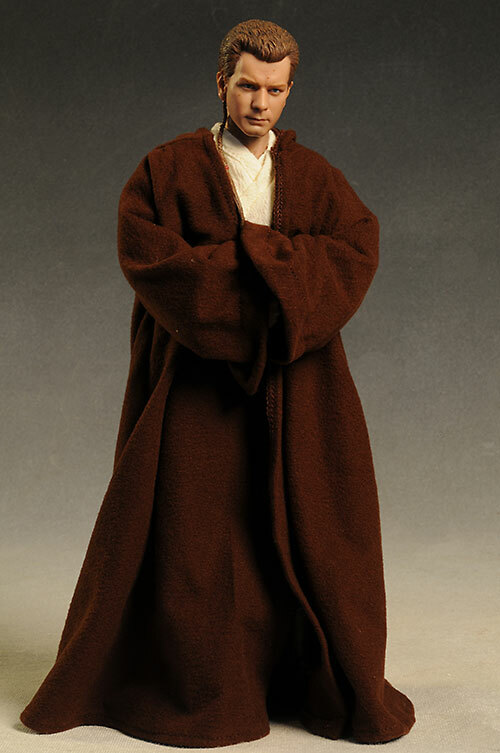 This gives you an opponent for Darth Maul now, and a figure to stand beside Qui-Gon Jinn. With all the advancements we've seen Sideshow make over the last couple years, the anticipation for this figure - at least for me - was quite high. 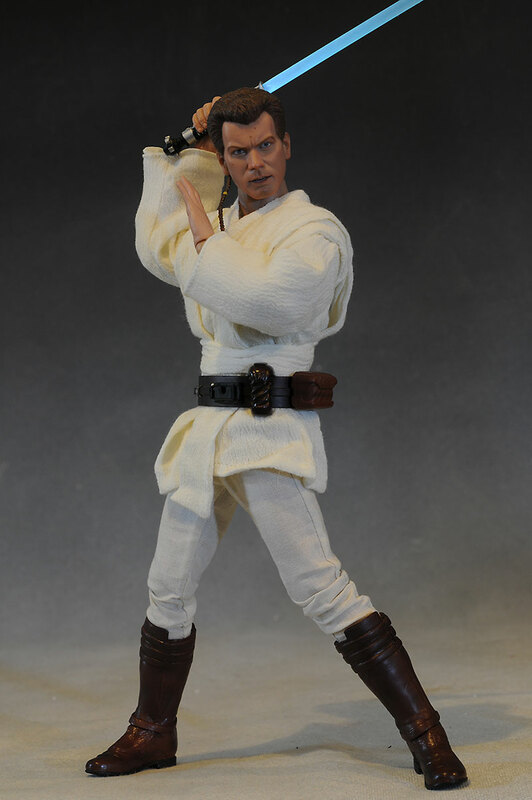 This figure comes in a regular version, as well as an exclusive Sideshow version. The Sideshow exclusive includes an extra portrait, with his battle face on. The standard runs $150, same as the exclusive, at least through Sideshow. You can find the regular for a few bucks less at some online retailers. Sideshow set the standard with collector friendly boxes at the very start of their work on this license. With multiple plastic trays, no twisty ties, and magnetic closures on the wrap around lid, there's absolutely no reason to damage any part of the box in getting the figure out. I did think the text and graphics were a tad off this time, dropping the score a smidge. I'm grading this figure on both portraits - if you pick up the regular, obviously you'll only be going on the normal head sculpt. That's actually a good thing, at least in terms of this category. The regular sculpt is done with a clean expression - not mad, not happy, just attentive and focused. 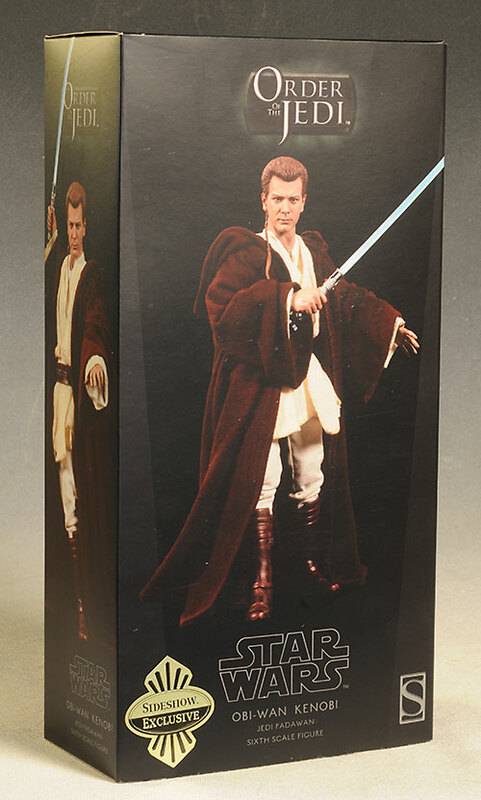 I like the expression, but I'm not really seeing Obi-Wan in the sculpt itself. The hair is too big, the chin too small, giving him a slightly weird pear shape. It's not a terrible likeness - just not as dead on as we've come to expect. The head is a tad bobbley too, a bit too big for the Sideshow body. Still, going on the standard head this would have still been a three star score, with the over sized nature the biggest flaw. The second portrait is the weaker of the two. The glaring expression, showing both sets of teeth and squinty eyes, just isn't working for me. 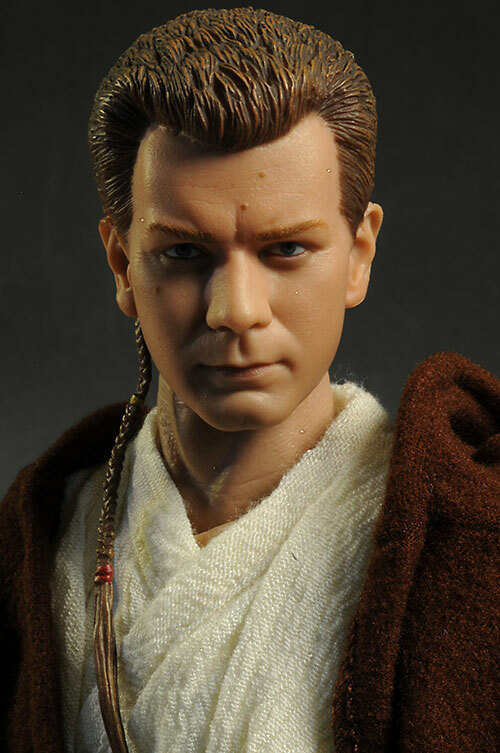 Even worse, he looks less like Ewan than the standard portrait. I see more Harrison Ford in the nose, mouth and chin than McGregor. The hand sculpts are great though, and having so many in all those different poses allows for a ton of great looks. With the truly life-like work being produced in this category by Hot Toys and Enterbay, it's safe to say our expectations are pretty high. That's probably one of the reasons why Sideshow has stayed away from the basic humans a bit in the last year or two. The paint is clean, and the eyes are straight and even. The skin tone is good, but doesn't have the slightly translucent realism of the best work on the market. I did have one quality issue, however. 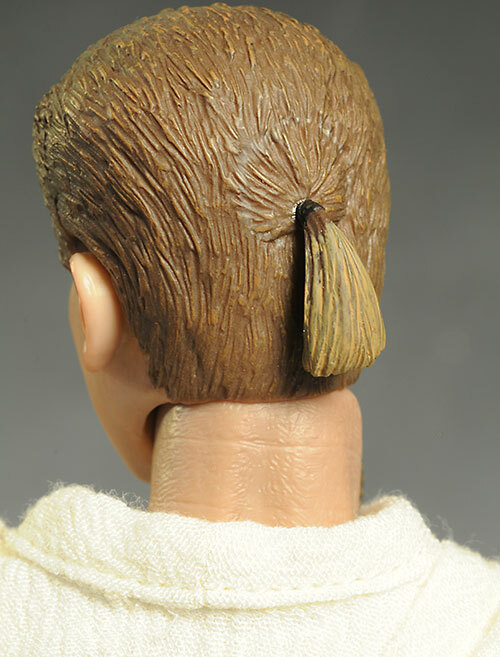 Obi-Wan's pony tail on both head sculpts is much lighter in color than the rest of his hair. There was a little difference on screen, but on this figure in person the difference is glaring, and makes the pony tail look like what it is - a separate piece of plastic. The underlying Sideshow body is reasonable, but not up to the standards of other figures in the high end market. The articulation is all here, including ball jointed neck, shoulders and hips, with double joints and pins all around. They have even done the boots as two separate pieces, allowing the foot to have a much better range of movement than the traditional boot design. I have a few problems with the overall body, however. First, he suffers from the same stumpy arms that have plagued the human figures since the first Luke Skywalker. It throws off the proportions, particularly when you aren't using the cloak. While I was able to get some decent upper body poses out of the figure, especially with the additional hands, I found that the lower body did not work as well as you'd expect, especially considering how articulated it is. The hips are a bit floppy, and the lower legs wanted to come apart at the knees. To recap - boots great, knees and hips weak, short arms bad. The exclusive version has a nice assortment of extras. 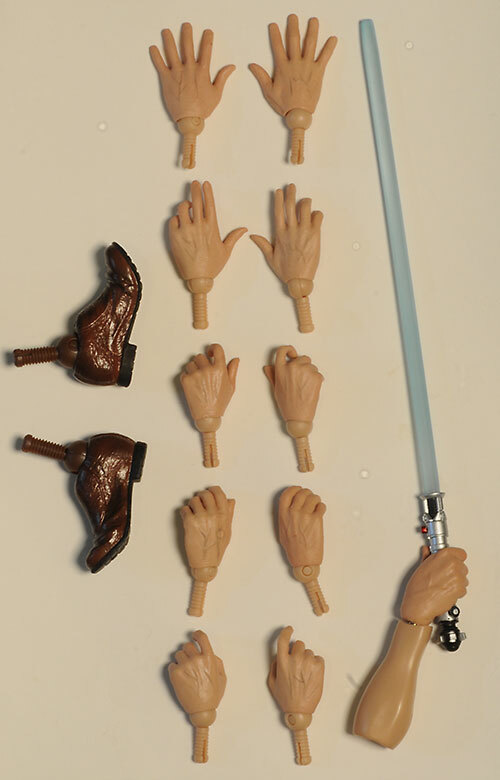 There's a whopping 13 hands in total - 6 sets that range from completely closed fists to fully splayed hands - and one extra right hand that operates the battery powered light saber. Some of these are designed to work with the additional saber hilts, while others are designed for specific poses. One of the things I like best about these hands is that every one comes with it's own peg. These pegs also are very sturdy, and I never had any fear of breaking them. There are two standard sabers, one ignited and one not. The hilt hangs nicely on the rubbery belt, and both have great sculpts and clean paint. The third saber is permanently part of the extra hand, and actually lights up. There is an extra forearm piece that holds three small watch batteries. You plug the hand into this arm section, and pull the end of the saber hilt to turn it on. For this category, that's enough information - I'll get into the details of the actual light up function in later section. 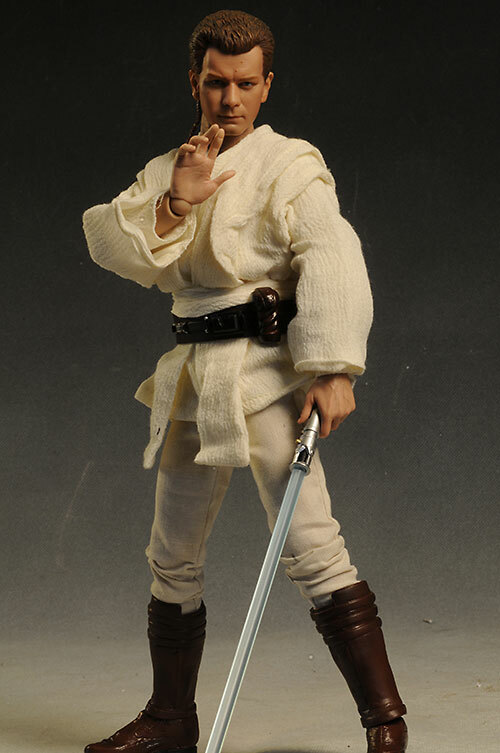 Obi-Wan also comes with a second set of feet, done in a half bent pose. These feet swap easily, and work well with the boot tops. Like every figure, there's a basic display stand. It works well enough, but isn't really necessary. When I received this figure, the single aspect I was most excited about was the battery operated light saber. They've come up with a really ingenious design for this feature. There's a separate forearm that holds three very small flat batteries. 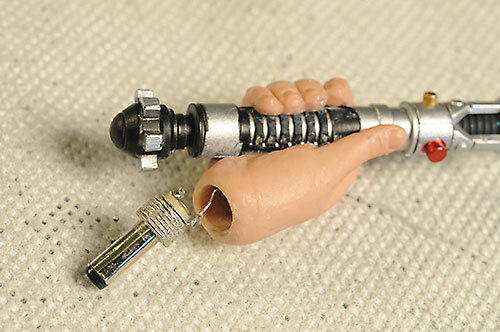 The hand and light saber are all one piece, and the wrist peg is actually a metal plug. Pop that in, and pull the end of the hilt to turn on the saber blade. I opened the battery compartment and removed the plastic tab, then popped the forearm on the body. It's easier to do that with the hand not on the arm, and the hand is designed to pop on and off - it has to be removed to access the batteries. However, as I worked with the light saber, the metal post started to get loose...and by the before you could save "Darth Maul is sliced in two" the post broke loose of the hand. I've included a photo to show the damage. I was still able to get it to light up if I moved it around just right, but it's not repairable, and I'll be calling Sideshow tomorrow for a replacement. What was the most anticipated feature of this figure ended up the biggest disappointment. 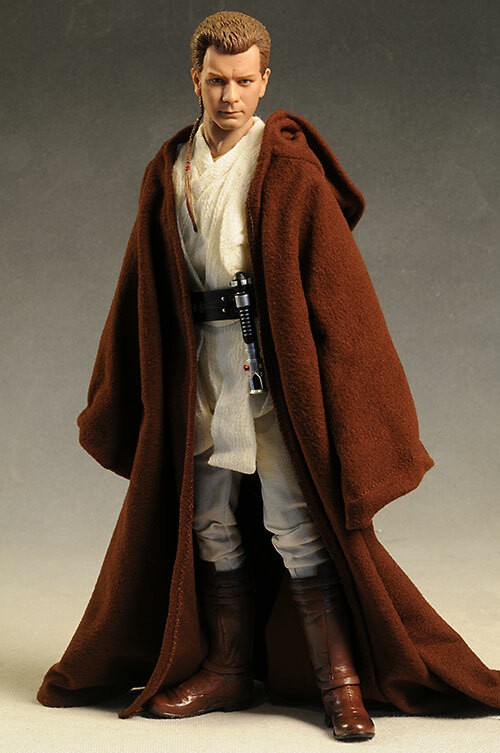 The outfit consists of his outer Jedi robe, his shirt, tunic and pants, as well as a rubbery belt with molded on extras. The belt is a bit weak for a figure this expensive. It reeked of paint odor out of the box, and is very glossy. The overall quality is a bit lower than what I expect at this price point. There's also the boots, which as I mentioned earlier, and are my favorite part of the overall costume. The Jedi robe looks good with the hood down, but no matter how I futzed with it, I couldn't come up with a hood up look that I liked. There's a long wire in the hem of the hood itself, but it's so long that it didn't actually help all that much. It did help keeping the hood down flat on the back though, and that's a decent enough look. The weaker body and the poor light up function hurt the overall play value here, even for the adult collector who wants to simply pose him and work with the saber. The Sideshow figures were getting close to Hot Toys/Enterbay prices, but then those two decided to go and raise their prices up to $200 and more. Now, still at $150, the Sideshow figures are looking like a better bargain. Still, there's several weak features here. The sculpt is off, the light feature was a disappointment, and the base body is still inferior. Even at $150, we still deserve a bit more. Had the sculpt been dead on and the light feature less fragile, I would have been much more forgiving in this category. Obviously, you need to take particular care with the light saber hand and forearm. All other aspects of the figure were sturdy, and shouldn't cause any issues. I was never that happy with the Sideshow humans, but it's been several years since the last one, and with their association with Hot Toys, their overall figure quality has improved in almost every category. Combine that with the cool light up feature, and I had very high hopes for Obi-Wan. Sadly, the padawan falls short. There were issues in every category - sculpt, paint, outfit, articulation - and at this price point, that's not acceptable. Even worse, what could have been the coolest feature of this figure turned into it's biggest flaw. I don't know if this issue of the light up saber failing is a wider spread problem - I specifically avoid other reviews before I write mine to avoid opinion contamination. I'm hoping it's not, but I can only judge based on what I have in hand. When you receive yours, I advise being very careful. - has the non-exclusive at $140. - has the regular for $150. - Sideshow has the exclusive for $150. Other Sideshow sixth scale Star Wars includes the recent E-Web Blaster and the matching Snowtrooper. - Sideshow also released the outstanding Bossk as well. And IG-88 was just before that. The Battle Droid and STAP is cool as well, along with the double pack of Droids. Commander Praji, Palpatine/Sidous, ANH Obi-Wan, Ilum Padme, Leia and Bespin Luke, the Holo-chess set, Sideshow's Asajj, a terrific figure, Yavin Luke, the Endor Troops, Jabba the Hutt and his throne, Bib Fortuna, Jedi Luke, Darth Maul, Obi-Wan, Bespin Han Solo, regular Anakin Skywalker and Kit Fisto. - I also have guest reviews of the SDCC Anakin Skywalker, Mace Windu, Emperor Palpatine and his throne, and Qui-Gon Jinn.